Woah. This upcoming gem from Universal Pictures amidst summer blockbusters just popped up out of nowhere, and I’m floored. Yesterday looks like it’s got just about everything an impressive cast, heart, comedy, music and a one-of-a-kind premise and I’m here for it! Danny Boyle’s latest film project, following his 2017 Trainspotting sequel, is completely out of his typical dramatic fare. But the movie is exciting nonetheless. Yesterday is written by British rom-com extraordinaire Richard Curtis, who has also penned Love Actually, Notting Hill, British Jones’ Diary and most recently Mamma Mia! Here We Go Again. 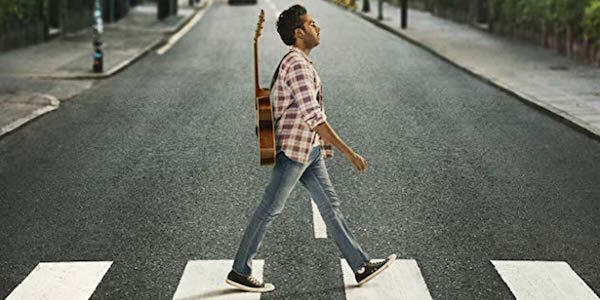 The film stars newcomer Himesh Patel as Jack Malik, who becomes the lucky man with the seemingly only surviving memory of the Beatles’ discography. As shown in the trailer, Jack gets into a bus accident during a freak-global blackout. When he plays the Beatles’ classic “Yesterday” in front of friends, including his childhood BFF Ellie (played by Mamma Mia’s Lily James), he finds out they’ve all forgot about the good ole mop-top British Invasion band. Jack then pays a public service to the world by injecting the Beatles’ greatest hits back into the world by performing songs like “Let It Be”, “Something” and “Hey Jude” and becomes a music legend overnight, starring as a guest on The Late Late Show with James Corden and working in the recording studio with Ed Sheeran, who hilariously suggests he call it “Hey Dude” instead. Jack also has a run in with an American agent, played by SNL’s incredible Kate McKinnon, who helps him book stadium shows and become a music superstar. In the meantime, the relationship with his bestie Ellie starts to become rocky as he becomes famous and the deception that he himself wrote these big hits starts to catch up with him. Given the excitement this trailer emotes, Yesterday could be easily one of the best under the radar films of 2019 and a breath of fresh amidst superhero releases, sequels and remakes. It could also be a stunning breakout role for lead actor Himesh Patel who has never starred in feature film, though may be known by some for BBC’s EastEnders. Add in the current interest in music-filled movies with the recent success of A Star is Born, Bohemian Rhapsody and the upcoming release of Rocketman ­– Yesterday could be just what audiences are itching for. The film comes out on June 28, though it opens alongside Ford v. Ferrari starring Jon Bernthal, Christian Bale and Matt Damon and between Toy Story 4 and the next Annabelle film.